A first of its kind application, based on J.J. Abrams' upcoming Paramount Pictures film, is now available to download for free from the App Store and Google Play. Users who have the app will have unprecedented access to all STAR TREK content, as well as the opportunity to participate in missions and win valuable prizes. HOLLYWOOD, CA (January 31, 2013) - "STAR TREK INTO DARKNESS" first of its kind application, based on J.J. Abrams' upcoming Paramount Pictures film, is now available to download for free from the App Store and Google Play. Users who have the app will have unprecedented access to all STAR TREK content, as well as the opportunity to participate in missions and win valuable prizes. Utilizing the latest technologies from Qualcomm Incorporated, such as Qualcomm Labs' Gimbal(TM) platform and Qualcomm Vuforia(TM) augmented reality platform, the app will allow users to delve deeper into the Star Trek universe by interacting directly with materials from the eagerly awaited film to unlock additional content and experiences. The users collect points, see content, and work their way through the Star Trek Academy. 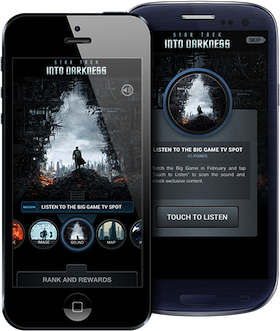 The app was first announced on January 7th, 2013 at the Consumer Electronic Show, during Qualcomm's Chairman and CEO Dr. Paul E. Jacobs' keynote address demonstrating the ability to "harness the power of the smartphone to bridge the digital and physical world, allowing the studio to market the film in the real world and simultaneously bring users into the film's story and world." * Exclusive opportunities and special offers only available to app users. "STAR TREK INTO DARKNESS" opens in theaters everywhere May 17th, 2013.